The infamous appetites of the Gilmore Girls are given their due in this fun, unofficial cookbook inspired by the show. Fans will eat up the delicious recipes honoring the chefs who fuel the science-defying metabolisms of Lorelai and Rory Gilmore. Whether you’re a die-hard fan or new to the scene, author Kristi Carlson invites you to pull up a chair and dig in. Luke’s diner menu, Sookie’s eclectic inn fare, Emily’s fancy Friday Night Dinners, and town favorites are the key influences behind these tempting dishes. One hundred recipes, covering all the bases from appetizers and cocktails to entrées and desserts, invoke key episodes and daily scenes in the Gilmores’ lives. 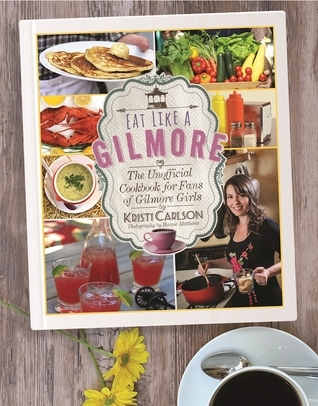 With beautiful photos, helpful kitchen tips, and fun tidbits about the show, this cookbook is a must-have for any Gilmore Girls fan. Easy-to-follow recipes make it possible to cook and eat your way through Stars Hollow. 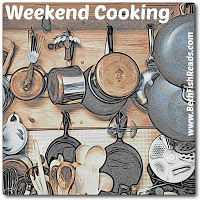 So don your apron, preheat the oven, and put on your favorite episode. It’s time to eat like a Gilmore! From the first episode, I was hooked! So much so that I didn’t watch anything else until I had watched all 7 seasons, and then I watched the “Gilmore Girls: A Year In The Life” and I’m hoping there’s a season two. This series is in my top 3 favorite series ever! I loved everything about this show. Lorelai , Rory, Luke, Sookie, I loved them all. Well, Jess was iffy but by GG: AYITL I was a fan of him too. I love all the other characters (and boy were some of them characters), the town, and the small town feel. Anyway, last week I was looking online for Gilmore Girl books and I ran across this cookbook on Amazon. I immediately ordered it. I love this book. Lorelai and Rory didn’t cook much and so their main meals were from Luke’s Diner, Sookie, or from the Friday night dinners at Lorelai’s parents house. I love that the recipes have a little background story from the show. There are so many recipes I want to try (I just got the book a few days ago so I haven’t tried any yet) like Banana Fosters French Toast, Roasted Duck In A Chocolate Orange Sauce, Zucchini Soup, Double Chocolate Chip Muffins. Everything sounds good. I love everything about this book. I recommend it to fans of Gilmore Girls or to anyone who likes to cook, or just likes to collect cookbooks. Hi Carole, I watched it on Netflix. So glad you finally watched the series and loved it! I’m a diehard fan from way back. The cookbook is a lot of fun and I enjoyed reviewing it last year. I wasn’t that pleased with the GG revival, though. Rory was just not the same. She seemed to be a bit off and not as caring as she was in the original series. Still, I think the ending might have been why. A lot on her mind. The book sounds fun. I don’t watch much TV, but will see if we have the cookbook here. Was the series based on a book or two? No, the series wasn’t based on a book but I would love it if it was. They ate some pretty strange things. I might make some of those too. I don’t watch tv but I would love to try those salmon puffs. I love tv, but sometimes I feel guilty for just sitting there watching it instead of being more creative or active. Although, I am rather active and that’s my down time. I hope you do watch it and I hope you love it as much as I do. I only saw one or two episodes of the GG so I am not that familiar with the show. However, the cookbook still seems like it would be fun! I couldn’t stop watching it once I started. It was one of the best shows I’ve ever seen. Like you, I didn’t watch GG until it came on Netflix, then I binged all the episodes. I too was hooked. I didn’t know there was a cookbook! *Must Have* I’d love to read how the recipes tie into the show, etc. Fun!!! I love this cookbook, I’ve only had it for a few days but it’s already one of my favorites. I still haven’t seen it but I know you fell in love! I like a good cookbook so I will check this out despite having no background with the characters. If you have Netflix you can check the show out. I don’t know anyone who watched it who doesn’t like it. My daughter loves this show (and looks a LOT like girl who plays Rory. People stop her on campus and tell her this) and insisted I watch it. I really enjoyed it though I had to quit because Lorelei’s mother reminds me so much of my own I had to stop because it was making me anxious. I think I have enough of a background with the show that I’d enjoy the cookbook and I’d love to see the recipes. Great review! Emily was a mix of good and bad wasn’t she? She grew on me more toward the end of the show when she seemed to mellow a lot.